Yorgia waggoneri is an unusual organism that is similar to both Dickinsonia and Andiva. However, unlike those organisms, Yorgia has a clear asymmetry to the arrangement of units that run down its length. It also has pronounced anteroposterior differentiation (i.e. its front and back ends are significantly different). The 'front' of the organism is characterised by fine branching structures that look similar to capillaries, and which taper toward the edge. An unusual asymmetric 'lobe' sits 'anterior' of the 'segmented' body. 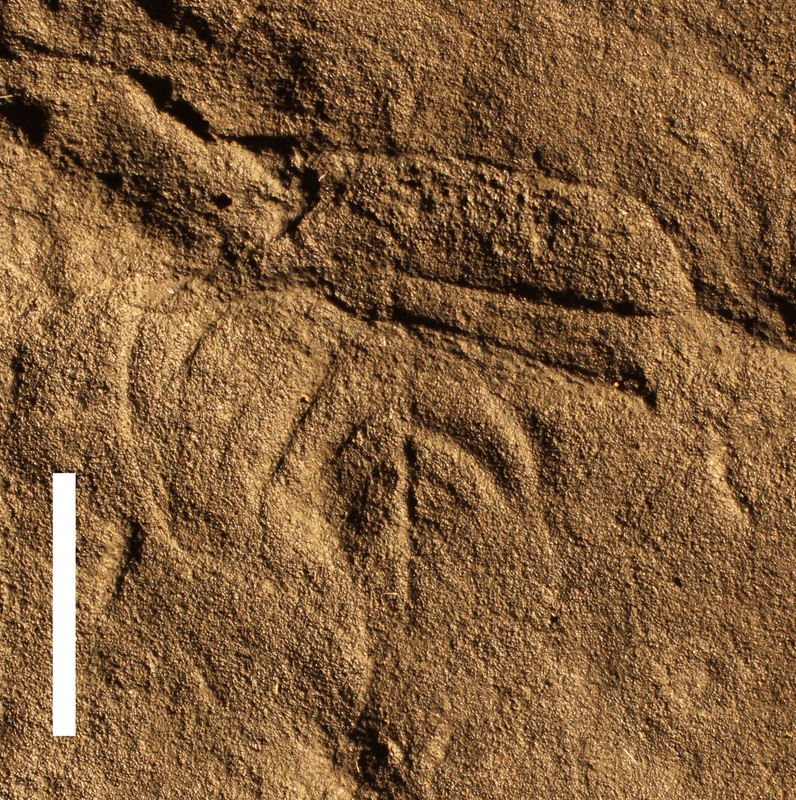 Trace fossils can be found closely associated with the body fossil impression of Yorgia, suggesting that it was a mobile organism (e.g. Ivantsov & Malakhovskaya, 2002; Ivantsov, 2011). Yorgia waggoneri, South Australian Museum specimen P49365. Scale bar = 1 cm. Modified from Coutts et al. (2016). ​Body with flattened upper and lower surfaces, relatively high, rounded in outlines. One margin pointed, opposite blunt. Body composed of two rows of narrow transverse elements of equal width. Elements of row displaced with respect to elements of opposite row along longitudinal axis approximately at one half of element's width. Angle between elements and longitudinal axis varies from 0 degrees on pointed edge to 90 degrees on blunt edge. Lateral flanks of elements pointed and bent towards edge of body.